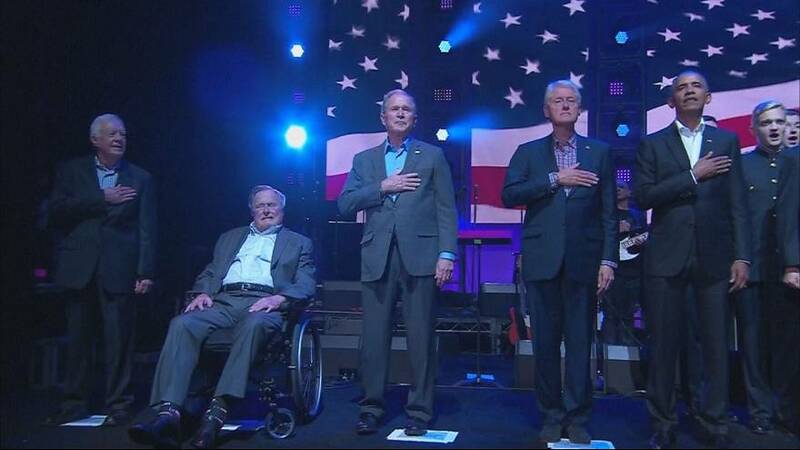 In a rare show of unity in American politics, five former US presidents appeared on stage together on Saturday for hurricane relief. Democrats Barack Obama, Bill Clinton, Jimmy Carter and Republicans George H.W. Bush and George W. Bush attended a concert in Texas as part of the drive to raise funds for the victims of recent disasters. The five presidents formed the organisation “One America” after storms left devastation in Texas, Florida, Puerto Rico and other parts of the US Gulf Coast and Caribbean. As well as the 11,000 in the hall the concert was livestreamed to many more outside. There were performances from several artists including one surprise appearance from Lady Gaga. President Trump was not there – but he did send a video message of support. The fund has raised more than 30 million US dollars so far. The 2017 hurricane season has brought the worst in nature, while bringing out the best in America. You can help at https://t.co/VJpGRIvunr.